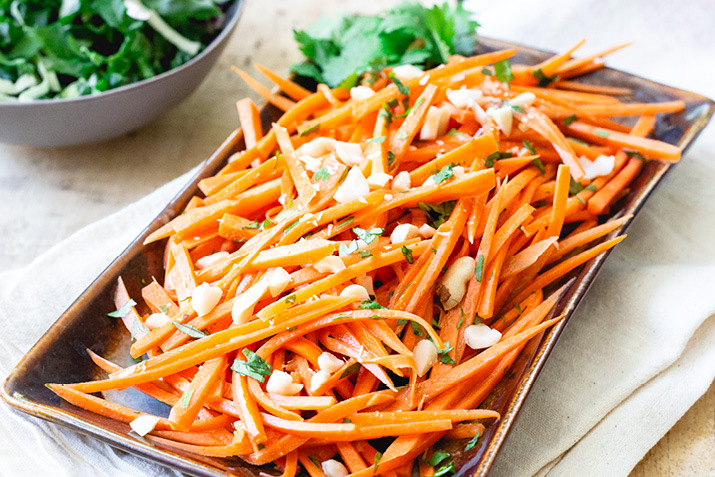 Lightly steamed carrots are tossed with a Sriracha-spiced peanut sauce in this tasty side. Steam the carrots to desired degree of doneness, around 2 to 4 minutes. While the carrots cook, place the peanut butter, garlic, soy sauce, rice vinegar, sesame oil, Sriracha and honey in a medium bowl and stir with a fork until smooth. When the carrots are done, place in a serving bowl, drizzle with the peanut mixture, and toss to coat. Serve sprinkled with cilantro.